Veronica Darling: Featured on Wardrobe Refashion! Jessica from Wardrobe Refashion asked me to be the Featured Refashionista on the site a couple of weeks back, and I was in full swing doing Outfits galore. So I finally got round to writing some stuff up about refashioning and she's posted it in the news section of the site! Yippee! I love refashioning! And I love the site! Anyone can join too, you don't have to be a total sewing queen or anything, and everyone is really encouraging when you post! It's from a couple of pillow cases, and gosh it's lovely! 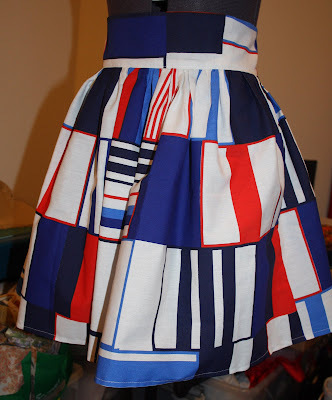 I gave it to my friend for her bday, and it's totally inspired a lot of other skirts! Yay! Hope your Saturday is just as nice as mine! I haven't really done much, but we had a little sleep in, went to doggie school and had some brunch in the sun in Marrickville at THE BEST cafe, the staff are all so friendly and the food is great. I hung up some new (but old vintage tiki style) curtains that I'd got at the Oppie a couple of weeks back, in our bedrooms and they look gorgeous, might take a piccie of their tiki style once I work out what's up with the camera (might have to get husbie onto that one!) and am going to MAKE SOMETHING NOW! Omfg it's been like a total week off! Not too sure what I'd like to make, so going to look through the stash now! I love the apron-ishness of this skirt. Nice.